In the month of October, the valley of the living Gods of North India, Kullu, dances and celebrates the spellbinding ceremony. It’s a special carnival which celebrates the joyful triumph of the God Ram over the evil power. The one weeklong festival is full of fun, social activities, shopping and most importantly the spiritual rites. The riveting and marvelous carnival commences on the "Vijay Dashami" which is also the 10th day of the rising moon. The social and religious significances of the captivating festival are immense. The fun filled dance and songs showcase the affection and love for the fiesta. It has a very own and prominent touch of hilly cultures and traditions. More than two hundred deities congregate on the prolonged and stunning Kullu valley during the sanctified Kullu Dussehra. All of them devote themselves and pay tribute to the Lord Raghunathji. The silver valley of Kullu is decorated with multiple colors. The tunes of music engage the mind and soul of the local people and visitors. Kullu Dussehra, the carnival of the rhythmic harmony, is celebrated with bliss and delight. Rama Lila, a drama played on the life of Rama, is a special attraction. 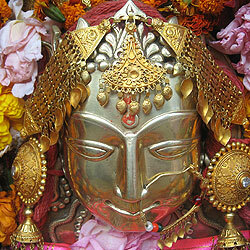 The idol of Lord Raghunathji, resides on a well decorated chariot on the very first day. The chariot of the lord, attended by village gods in colorful palanquins, is pulled with lot of interests from its fixed spot in Dhalpur Maidan to another place across the Maidan by Big twisted ropes. All the deities in and around the Kullu valley have to visit the pious place on Dussehra in order to pay homage to Raghunathji. People continue buying, selling, singing and dancing during the seven days to enjoy the festive occasion. The festival ends with renowned Hindu rituals. Burning of the Lanka is one of them. The burning pile of wood grass symbolizes the burning of the Lanka. 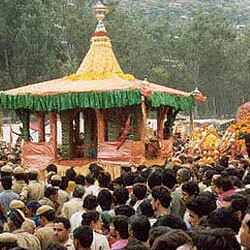 The chariot of Raghunathji usually is taken to the banks of the River beas on the very last day of the fiesta. Animal sacrifices are also there. The history of the prime festival of Himachal Pradesh, Kullu Dussehra, dates back to 1637 A.D. The king Raja Jagat Singh got information from a reliable source that the peasant Durga Dutt of Tipri village had numerous valuable and precious pearls. The king wanted to obtain these precious items. Even though the king repeatedly requested Durga Dutt to give those pearls willingly but Durga Dutt refused. Durga Dutt tried to convince the king that he doesn’t own any pearl but the king didn’t believe. The king, Jagat Singh, gave him a last opportunity. Durga Dutt was scared and decided to burn down his own family and house and cursed the king for his brutality. His curse resulted in king's leprosy. After that the king realized the fact that he was wrong.